Occasionally I meet with some friends who work at the UNHCR, just to chat and have a bite to eat. We like to talk about each other’s work experiences and exchange our views on current events. I remember one particularly hot and intolerable evening. With dusk setting in and everyone getting off work, K brought a group of people to a first floor coffee shop at a UN building. With everyone around busy doing nothing, we discussed a variety of topics. K’s main responsibility is dealing with regional refugee issues. She’s in Bangkok because it’s the location of the UN Asia-Pacific headquarters, but geography is also part of the equation. This naturally attracts a large number of refugees seeking asylum. According to UNHCR statistics, most refugees come from Myanmar, Cambodia, Vietnam, Bangladesh, India and even China (this includes those seeking political asylum). Just last year nearly 2 million people arrived in Bangkok, via legal and illegal means, to apply with the relevant agency. On top of that, more than 120,000 refugees are unable to obtain entrance into Thailand and end up housed temporarily in UN and other NGO refugee camps located at the border. “Despite the fact that the situation here is dire, most international media is based in Europe with the Asia-Pacific region left out of the discussion.” From the bottom of her heart K told me how, due to the wide variety of languages, the situation in Asian countries is much more complicated than in Europe. In addition to a shortage of interpreters, Thailand has not signed the 1951 United Nations Convention on Refugees. For various reasons, handling operations are twice as difficult and the procedures for transferring refugees has become especially arduous. 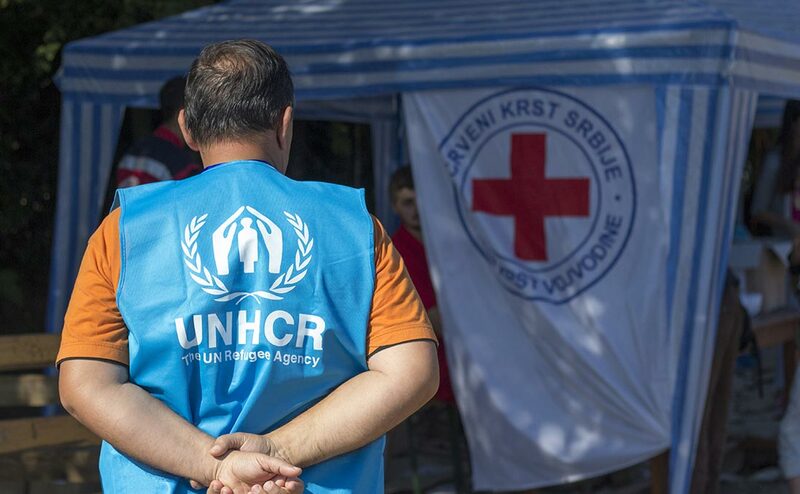 “As a humanitarian aid worker, we naturally hope that we can do more and more cases” However, Even if one arrives in Bangkok and is sent to the UNHCR through the help of different international organizations, it is not easy to obtain refugee status by filing petitions through the Justice Syste. Moreover, in order to obtain the willingness of other countries to accommodate refugees and protect against fraud, the examination of identity and other qualifications of the refugees is often very time-consuming. Many times the basic required information, such as birth certificates, is simply not available. One month, two months, one year, two years…many people in need of help spend their time like this, in temporary shelters or other shelters run by various NGOs. Even more illegal immigrants end up detained by Thai authorities and are in Immigration Detention Centers, IDC. The staff from UNHCR refer to the people as clients instead of refugees. “What left the largest impression on us was how every time we went to visit our clients, the most difficult thing was watching their eyes turn from hope to loss, and then eventually to death…” However, when one link in the complicated process fails to meet the standard, the host or whatever country the refugee is currently in has the right to refuse issuance of a refugee document. The story hasn’t ended yet. In April of this year, with K and his colleagues exhausted, the identity verification and other procedures were concluded and A’s application for refugee status was approved. When they told him the news, that he could go to a third country to start a new life, possibly to the USA, Australia, Canada or Japan, there wasn’t a trace of joy in his eyes, only fear and confusion. ”But, I’ve been here for 18 years, this is my country.” A blankly muttered to himself. “No, no. This has just been a temporary customs detention. We are here to help you get a new identity and arrange a new life for you. The Thai Immigration Department’s release order is in effect” K said, trying to convince him. “No, this is my home. I don’t want to go anywhere else” A said stubbornly, with anger, panic and even a bit of begging in his voice. “In the end, he killed himself. The last time we met that next day, he’d used a pair of jeans to hang himself outside of the iron bars on the prison cell window.” K said indifferently, while rolling a cigarette. When the sun is still hot, but the surrounding air seems a bit more wet, cold and sticky, it makes everyone breathe harder. Perhaps the saddest thing about the whole situation isn’t the death of a person. It might not even be the desperate life of a displaced person. Maybe it’s the long wait in a tiny room filled with a giant loneliness, and the exclusion from the rest of the world, leading someone to prefer to end their life, rather than accept and new possibilities. Jack Huang is a consultant working for United Nations Peacekeeping Mission. Studied in London and current live in Bangkok. Freelancer to many online media. He speaks English, Chinese and Thai.